I have created quite a tradition of baking myself a birthday cake over the last handful of years. The first year I did it I made an Oreo cheesecake, then I did an orange and cream cheese icing twist on Dorie Greenspan’s Perfect Party Cake, and now this beauty. Hmm, there seems to be a theme of cream cheese. I do love my cheesecake. And my cream cheese icings. And peanut butter. And chocolate. And, well, so many other things (pizza, burgers, popcorn, soft pretzels, pizza… oh, I said pizza already). But today I decided to celebrate not only my birthday, but my love of cheesecake, chocolate and peanut butter. And what a delicious celebration it is! The inspiration for this dessert came from a couple of different places. First, let’s go back to an old-school favorite – the Dairy Queen ice cream cake. For the better part of 10 years, whenever my mom would ask what kind of birthday cake I wanted the reply was always the same: a Dairy Queen ice cream cake. Truthfully, I could do without the ice cream or the whipped topping. I was in it for the fudge and chocolate crunchies in the middle. It was totally the best part. I always saved it for last, eating around it, and then savored each forkful. And so, I started off this dessert with that in mind. Being absolutely insane for chocolate and peanut butter together and loving peanut butter cups, I decided that chopped peanut butter cups would take the place of crunchies on top of the fudge layer. The rest of the cheesecake took shape quite naturally. There needed to be an Oreo crust because I believe they make the best cheesecake crusts. Especially if peanut butter or other chocolate is involved. (In any other case, this shortbread crust is my go-to.) Given my love for cheesecake and my love for peanut butter (especially when sitting on top of a layer of fudge), I put together a peanut butter cheesecake. 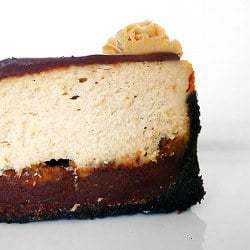 Finally, after making the Chocolate Peanut Butter Torte again for my Chief Culinary Consultant’s birthday back in February, I realized how much I love the idea of a chocolate ganache on top of a cheesecake-style dessert. It gives it a smooth and finished look and provides a great canvas on which to decorate! And so there you have it: my decadent, rich and wonderfully chocolate-and-peanut-buttery 30th birthday cake. It’s for the little girl in me that cherished a peanut butter and jelly sleeping bag more than anything when she was a kid. And for the slightly more grown-up girl that managed to grow out of a peanut allergy that reared its ugly head when she was 24. And that Reese’s Big Cup on top? My Chief Culinary Consultant bought me a whole bag of them the weekend after I learned I was no longer allergic last year. I have a soft spot for them now. Did I mention that my Chief Culinary Consultant is awesome in every way possible? He is. Don’t wait for your birthday to make this; it’s much too good to keep filed away. Bake it, to celebrate all of the wonderful little things that happen between the birthday cakes. 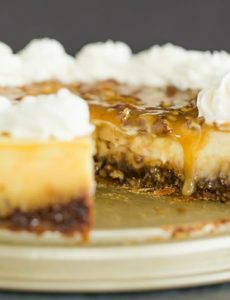 This baked cheesecake is perfect for any occasion! 1. Preheat the oven to 325 degrees F (300 degrees F if you are using a dark or non-stick pan). Butter a 9" springform pan and set aside. 2. To make the crust, stir the Oreo crumbs, melted butter and salt in a small bowl with a fork until the crumbs are moistened. Press the crumbs evenly over the bottom and up the sides of the springform pan. (I like to use the bottom a measuring cup to press the crumbs around the pan. I've found that they get evenly distributed that way and end up looking neater around the sides.) Freeze the crust for 10 minutes. 3. Bake the crust for 10 minutes, then transfer it to a rack and let cool. 4. To make the fudge, put the chopped chocolate in a bowl. Heat the cream to a simmer over medium heat. Immediately pour the simmering cream over the chopped chocolate. Let stand for 1-2 minutes, then add the vanilla extract and stir with a whisk or rubber spatula until smooth and combined. Pour the fudge into the cooled crust and spread evenly over the bottom. Place in freezer for 10 minutes. Remove from freezer and sprinkle surface with the chopped peanut butter cups. Return to freezer for 10 more minutes. 5. Meanwhile, prepare the cheesecake filling. Beat the cream cheese and peanut butter together on medium speed until smooth. Add the sugar and vanilla extract and continue to beat on medium speed until thoroughly combined. Reduce the speed to low and add the eggs one at a time, beating until combined after each addition. Scrape the bowl and mix on low for another 20 seconds. 6. 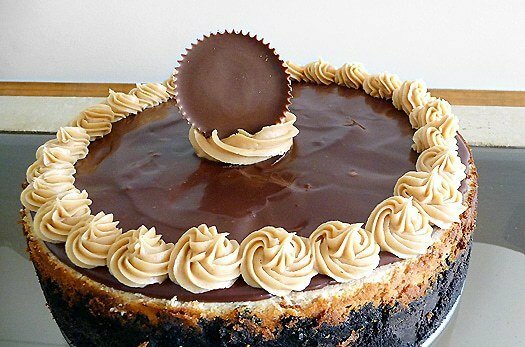 Remove the pan from the freezer and pour the cheesecake filling over the fudge and peanut butter cups. Bake until the sides of the cheesecake are set and the middle just slightly jiggles, about 1 hour. Transfer to a wire cooling rack and cool to room temperature (at least 1 hour). Refrigerate the cheesecake at least 4 hours or overnight, until thoroughly chilled. 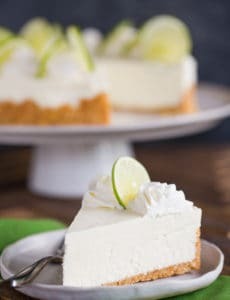 To unmold the cheesecake, wrap a warm towel around the outside of the springform pan to loosen the crust from the sides. Carefully remove the sides from the springform pan. 7. Before serving, prepare the ganache topping. Place the chopped chocolate in a small bowl. Bring the heavy cream to a simmer over medium heat. Immediately pour the simmering cream over the chopped chocolate. Let sit for 1-2 minutes and then stir with a whisk or rubber spatula until smooth. Pour the ganache on the top of the cheese and, using an offset spatula, spread evenly over the top of the cheesecake. Return to the refrigerator to set the ganache, about 20 minutes. Garnish as desired (I had some leftover peanut butter icing from filling a customer cake, so I piped that around the border). I must admit, I do not like peanut butter at all, not peanut butter cookies, blossoms, candy, sandwiches & you especially will not find me eating spoonfuls out of the jar. But my friend loves it & I wanted to make this for her! It was amazing!!!!! Everyone loved it, including me! I am a limited baker & this was 1 of a handful that I have ever made & I will definitely make it again! Thank you! Made this for hubbys birthday today, I can’t wait to try it!! 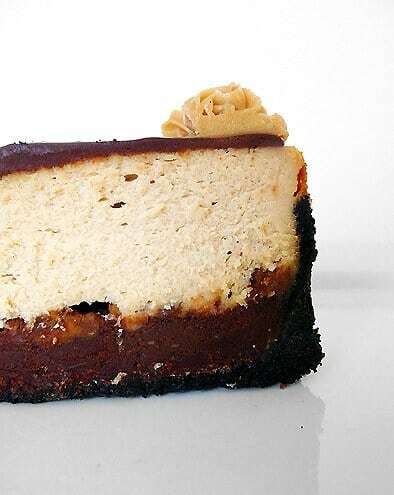 I’m making this and a few of your other cheesecakes for a wedding. They need to be pre-sliced but still in their original cheesecake form! What is your recommendation for doing that so it great?! I know to wipe the knife after every cut but wondered about cutting. Should I do it very cold and when it starts to get warm, put it back in the fridge to harden again and then resume? Do you recommend putting pieces of parchment betw each slice??? Help!!! Hi Juli, I would actually use (unflavored) dental floss! It makes super clean slices – I’ve done it a few times. You can google it and there are tons of YouTube videos. Good luck! Thanks! When is the best time to cut it? Before it hardens overnight? Also, regarding cutting it and still leaving it “together”, what is the best way to do that? Hi Juli, No, I would wait until it sets. As for keeping it together, if you use the dental floss trick, it will all be perfectly together – the cuts are thin and clean. Can you tell me which tip you used to make the rosettes on top of the cheesecake? I’d like to try it. Thanks! Also, once you put the rosettes on the cheesecake, do they keep their shape for a few days? Hi Janet, Gosh, I honestly don’t remember, but it looks like an open star tip, so it was probably a Wilton 20, 21 or 22. I can’t tell from the picture exactly which size, but I’m guessing 21. And yes, the rosettes definitely hold their shape! Thanks so much, Michelle. I bought a set that has a 32, a 105, a 1M and a 2D. I bought the Twist Quick Coupler so I may just experiment. 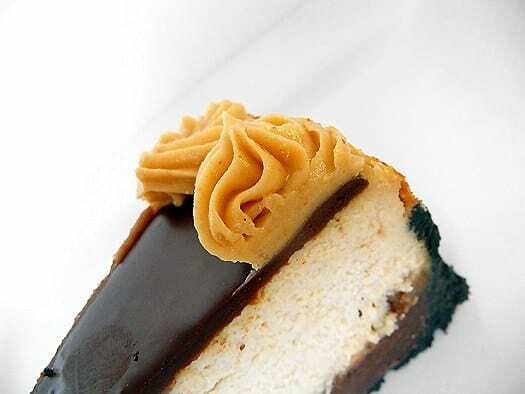 I just made a peanut butter cheesecake with a ganache topping for my son’s 30th birthday and want to try decorating it using this peanut butter icing. I will check into the other tips for the future. I used the #32 tip because that was the closest I had, but I will definitely get a #21 for the future. I tried to post a photo, but was not able to. Thanks again, Michelle! This with Reese’s Oreos….ahoy. It’s time to kiss postpartum weight loss goodbye. I hear the cheesecake calling…. Hi Michelle. I sent a question a few days ago asking about freezing cheesecake. In your response you noted it was fine to freeze and then thaw in fridge. I am considering making this cheesecake for an auction that will be held outdoors. Would it be okay to freeze in advance and then let it thaw at “room temp”, outdoors at the auction on the table? Please let me know as this auction is coming up within the week! Thank you! Hi Juli, I would not recommend thawing at room temperature, especially outside since it would be warmer. I would stick with the refrigerator, then transport the thawed cheesecake to your auction. I was wondering if you were to make these in a mini form (in a cupcake pan) how long would you cook them? Or any cheesecake recipe for that matter. Hi Mary, I’m really not sure, the baking time will be much shorter, obviously, but I’ve never tried to make cheesecake in muffin tins, so I can’t give you a specific time. I’ve been following your blog for a while and this is not the first recipe of yours that I made, but it was the first I just had to comment on! This is only the third cheesecake I’ve ever made, but it was so simple to put together and turned out oh so divine!! I brought it to a dinner party and everyone raved over it!!! I had to make a few small adjustments, since it’s hard to find American style peanut butter here. I used 1/2 cup + 2 tbsp natural peanut butter, 1/4 cup butter, and an extra 2 tbsp sugar, and it tasted just like I hoped it would! Thank you so much for all of your wonderful recipes (and your doggie updates, Einstein and Duke remind me of my own Golden!) and can’t wait to try another! Pingback: Braised Short Ribs with Cheesy Grits (Slow Cooker) | Best Recipes! I made this cheesecake over the weekend and let me just tell you- it was fantastic!! I was a little scared at first, it looked so intimidating, but it was fairly easy to make. Everyone loved it! Thank you so much your website is fantastic and all your recipes look so delicious! Wow! What a great cheesecake! Made it for Christmas and several people commented. My husband thought it was a little too much chocolate (and he was very wrong), but it did make me think about possibly making the same cake using Nutter Butter cookies for the base. Is it too soon to make another one with the change if we still have a small portion of the first one in the refrigerator? I just made this but had a few concerns. I had scraped the middle of the oreos out because the recipe didnt say to leave them in… will that affect the crust? Also I used 4 eggs but the recipe didnt say what size egg. Is it possible to clarify that? Is the mixture supposed to be that creamy and not more liquid like batter? I just put it in the oven so Im excited to hopefully see if it turned out well or not. I put a water bath under the cheesecake on the bottom rack and the cheescake on the top rack because any cheesecake I have made usually requires that but the recipe didnt say so I got nervous. So many questions I know lol But I just need some clarity!!! HELP! Kristy, You are to use the whole cookie for the crust, you do not need to remove the cream filling. Unless otherwise stated, you should use large eggs for baking. wow!!! this cake looks amazingly delicious!! can we use a square pan to bake this? i must try this! Hi Jona, If it is a springform pan with the equivalent volume as the 9-inch round, go for it. Otherwise, it may not accommodate the amount of batter. This cheesecake is currently in the oven for my husband’s 29th birthday. I can’t really imagine anything going wrong… As if there weren’t enough peanut butter , I splurged and used the peanut butter cream Oreos for the crust. Thanks for another great recipe! This is a fabulous recipe. Made it as a birthday cake for a cheesecake lover. The taste was phenomenal. Just one question Michelle… the texture of my final product was a “soft” cheesecake. For future reference, is that how it’s expected to be? Hi Sharon, Yes, it’s on the soft side, versus a drier, firmer texture. I’m glad you enjoyed it! Looks great. 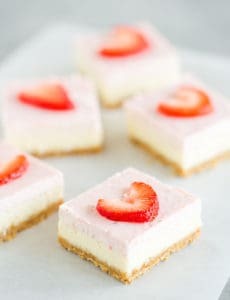 I hope you can check out my variations of cheesecakes on Facebook. It’s called Nick Knack Cheesecake. Would there be any way to use brownies instead of the fudge? Hi Ivy, Do you mean putting down a 9″ round layer of brownie? Or cut up brownies? I’m sure you could try it; I haven’t made it like that, so unfortunately I can’t offer much advice or guarantee on how it’ll turn out. If you try it, I’d love to hear how it worked out!